This article has been written with the support of StAnza. Find out more. In periods of great uncertainty, poetry can be a means of comfort for many, reassuring, soothing or even challenging in its form and function. 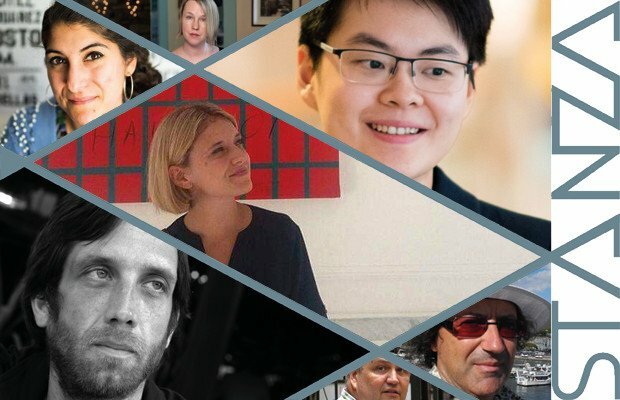 Each year, StAnza (Wed 6–Sun 10 Mar) delivers a programme packed with the finest voices in the poetry world, ranging from world-renowned writers to emerging performers who aim to engage audiences with key issues in a creative and constructive manner. As Scotland's international poetry festival, StAnza continues to remain open, welcoming and positive in its events, installations and exhibitions, reflected both in the poets and artists invited to take part and also in this year's theme of 'Another Place'. With its international focus contrasting directly with an increasingly insular political climate, we caught up with a handful of poets taking part in StAnza this year to get their thoughts on why the festival – and poetry on the whole – are vital in the exploration of new ideas, places and the unfamiliar. Nadine Aisha Jassat: I am so excited to be part of StAnza this year, it's a fantastic festival in a fantastic place. I'm in particular really excited to be at an event alongside Mary Jean Chan – and feel both humbled and energised to be taking part. I'm also looking forward to taking part in Glasgow Women's Library's Story Café session, which will be looking at the work of women poets of colour in Scotland – including a guest reading from St Andrews based poet Zein Sa'dedin! George Mario Angel Quintero: I am all plums and cherries to be part of StAnza this year. For the last couple of years I have been listening to poets talk enthusiastically about this festival. Scottish, Irish, Welsh, and English cultures are all so rich that the temptation exists for a festival like this to become insular or regional. This is the perfect moment for a celebration and exploration of diversity. It is important that a festival like StAnza insist on its character as an international meeting place for culture. Laura Accerboni: I am very happy to be part of the StAnza Festival. Its international nature allows the meeting with different rhythms and visions, opens new possibilities, creates weaves. It's a very rich program, we are going read and listen to a lot of poetry. Brodskij wrote: 'I am certainly certain that those who read poetry will be less easily defeated'. This festival, and poetry in general, allows us to be resistant. Mary Jean Chan: I'm excited to be a part of StAnza this year. I think poetry festivals are a great way for poets from around the world to meet one another and to be inspired by different poetries and poetics. I've always been hopeful for the future of poetry. As long as language and beauty continue to matter to people, poetry will thrive. Marco Fazzini: The growing number of international poetry festivals in Europe and the Americas suggests that we are increasingly in need of the beauties of art, poetry and music. Despite the re-surfacing of right-wing politics around the world, people still want to get together and create a dialogue across boundaries and differences. I'm sure that my participation at StAnza this year will be a precious and refreshing opportunity to talk, exchange ideas and make plans with fellow writers for future collaboration. A.E. Stallings: I'm excited to attend. The future of poetry is right now about the only future I am hopeful about. 'In a dark time, the eye begins to see,' as Roethke puts it. But yes, I think the international nature of the festival is hopeful at a time when we need more communication across borders, not less. Balázs Szőllőssy: I believe these kind of gatherings are the ones which, in a shrinking world, still make people – at least the participants – feel that there is anything at least similar to what we call 'world literature', and that an outreach for understanding each other still exists. Poetry is the most delicate way of speaking a language, and festivals which make the effort to make us even a tiny bit more sensitive to each other's words and thoughts make me feel hopeful for the future of humankind in general. Nadine Aisha Jassat: I often feel that poetry is about connection, whether by poets connecting to themselves through their writing, reaching out to their readers through their work, or connecting to others and communities through teaching and creative practice. In this current climate, poetry provides just one opportunity for that connection to happen; to share stories, create connections, ask questions, and raise challenges. George Mario Angel Quintero: As a discourse that intuitively delves into what is most vulnerable and characteristic about us, poetry will always be subversive in a repressive context. I can only hope that as many people as possible come to St. Andrews to share in an atmosphere of generosity and celebration as the more than one hundred participants in the festival are given that precious chance to share their word-music, gestures, and images with the enthusiastic community that has invited them. Mary Jean Chan: There's a favourite quote of mine, by the poet Adrienne Rich: 'poetry / isn't revolution but a way of knowing / why it must come.' Another quote by the poet and Poetry Review editor Emily Berry: 'In this ever more precarious life I'm drawn to poems that make me feel as if I'm holding a feeling and I don't know whose it is. Poems that make me feel vulnerable and responsible.' Rich and Berry have said it much better than I can. Marco Fazzini: While poets and poetry are not the 'legislators' of the world, we know that happy coincidences have helped poetry to contribute to political change: think of Senghor in Senegal; Alegre in Portugal; Césaire in Martinique; Cardenal in Nicaragua; Havel in Czechoslovakia/Czech Republic; and Neto in Angola. When people counter oppression with creative expression it can result in a society and its writers forming a virtuous circle. A.E. Stallings: Poetry holds words accountable; it is a refuge from the assaults on truth and meaning. I suppose it was the original social media, but the news in poetry (as Williams might say) is not fake news. Nadine Aisha Jassat: Much of my work deals with the theme of memory, translating experiences from one place to the other. It is that bridge between the past and the present, somehow inhabiting both, and yet living in another place of its own. A lot of my work is about narrating from that other place, exploring the past and looking at its impact on the present. Much of my collection, Let Me Tell You This, takes readers on this journey from the other places I have been in, and lived through, to where I am now, as well as the connections between women, both historically and in my own life, in healing, sustaining, and surviving. George Mario Angel Quintero: 'Another Place' speaks to me of alternatives that are only just being imagined. The world is there to be dreamed. Our identities, the language we carry within us, the traditions we come from, are roots coming together. Another place is the moment of sprouting, the moment of piercing through the surface. This is a way of saying another place is our communication as it occurs now. Poetry short-circuits the usual connections in the space between us. Laura Accerboni: It's a beautiful theme. Art, poetry can create new spaces even in places where everything seems to be closed, tight. In my work, I try to show this closure, all its absurdity, I try to make it so obvious that it is emptied and so make room for other places. Marco Fazzini: There are many opportunities for investigating new worlds: travelling at low cost; news via the media; the international distribution of books; connecting with various social networks for the exchange of photos, 'digital' books; and so forth. These tools are a great help to all of us, enabling far more research and exchange than was possible in the 1960s or 70s. If used in the right way, they make possible imaginative, social and geographic travel. For me, this enables access to a wide variety of influences, extended readings' intertextual games, and collaboration with distant friends, poets and translators. One can sit at one's desk and be at home and in 'another place' at the same time. It's a fantastic feeling! A.E. Stallings: I have spent most of my adult life in Greece, living in another language and another culture from the land of my birth. Maybe a poet is always otherwhere. Since 2016, I have also been spending a lot of time with asylum-seekers in Greece, with people who have fled their homes and are in a kind of limbo waiting to see where there future will be. I have become acutely aware of this displacement. Balázs Szőllőssy: This topic is one of the main focus points of my way of wiring poetry. I believe that location and the feeling of home is strongly connected to the identity of the self (identity being one of my other main interests), and thus the search for identity is always a journey to and from the place we call home. Nadine Aisha Jassat: I've always loved the saying 'home is where the heart is', and there's a lot of heart in my poems, so take that as you will! I was recently commissioned by Young Scot to write on the theme of home and place, and the baking themed poem which came up (and I'm not necessarily a big baker!) explored my feelings on home and that idea that we can make our own, and carry it with us. For readers, I imagine while the writer might have one place in mind to transport the reader to, the reader may in turn tune in to another – reading something of the poet's sense of place in their writing, but perhaps also responding with own, too. George Mario Angel Quintero: I speak and write in two languages that are mine. My concept of home is the distance between two points. As someone who is multiply native, I understand the necessity of ideas like 'Another Place' in order to construct new models for what home might be. Being a writer in two languages that do not meet makes me a particular kind of writer within each of those languages. Both in English and in Spanish, my work pressures into and through language to a kind of elemental place. Laura Accerboni: The 'house' is a recurrent image in my recent poems. I think that the historical moment we are experiencing, the dramatic migration and the criminal response by some politicians, have made images of places and of houses central in my writing. Literature has the power to tell, to make familiar places look alien, to show us our reality in a different light. And yes, to lead us where we do not know. Marco Fazzini: My first collection focused on the different kinds of sand I had encountered (and walked on) in the early 1990s: the Namib Desert, Death Valley, the beach at St Andrews, in Cape Town, etc. The idea was to take the reader to 'other places' and investigate the different feelings coming from deserted or secret geographies arising out of critical cultural contexts. It was also the very beginning of what I could define as one of my major 'themes': the passage of time and the transformation of the natural elements. George Mario Angel Quintero: Racism and violence are born from isolated perspectives. The very act of writing poetry is a gesture toward contact and toward understanding. Poetry is intuitive and intimate language that touches on the universality of human experience. Even when it does not mean to be, it is in opposition to intolerance and cruelty by its nature. Poetry will not change or save the world. But it will always be on the side of resistance to hate. Laura Accerboni: Yes, I am sure that poetry and art will move more and more in this direction. Romanian poet Jebeleanu in one of his texts imagines History turning to Poetry and telling it: 'Friend come, see what happens, what you find, and tell'. I think there are historical moments in which this appeal becomes stronger. A.E. Stallings: I think much of the resistance in the poetry world is social media posturing, to be honest, but of course one would like to think the poetry world would resist intolerance. Editors, anthologists, and festival organisers can be conscious about including many kinds of voices. Poetry is enormously diverse at present; there is so much going on. Balázs Szőllőssy: In general, I would say, the spread and use of poetry in a society actually depends on how free its public is to talk, not the other way round. Poetry, at least published poetry, is always a political matter in the broad and original meaning of politics – a thing concerning us, and as it is published, it is intended to be so. Marco Fazzini: In one of her recent poems, Gioconda Belli, one of the major novelists and poets in Nicaragua, says that we need time, love and horror for poetry to be lit as a lamp, to let it issue forth with matches and fireflies to brighten the night. Resistance in poetry will always be synonymous with rebellion, renovation and linguistic revolution. Poets are always the first, in any particular society, to respond to these kind of coercive conditions: I am looking forward to reading a new imaginative and poetic 'resistance' in this right-wing political climate. The Italian poet Giorgio Caproni, in one of his Roman lectures in 1982 said, 'The poet is a miner. The poet is that person who, better than any other, can deeply go down to what Machado defined as the secret galleries of the soul, and there draw some knots of light.' Our role as writers, translators and organisers of poetry events is one of delving into those 'galleries of the soul' and re-surfacing with some knots of light in our hands so as to better understand and weather dark and difficult times. StAnza: Scotland's International Poetry Festival, St Andrews, Wed 6–Sun 10 Mar.